Next week, Brooklyn Brewery will release The Defender, a hoppy, amber, draft-only IPA it brewed especially for New York Comic Con. The Defender will be officially released at a launch party on Tuesday, September 25 at the Brooklyn Brewery tasting room. 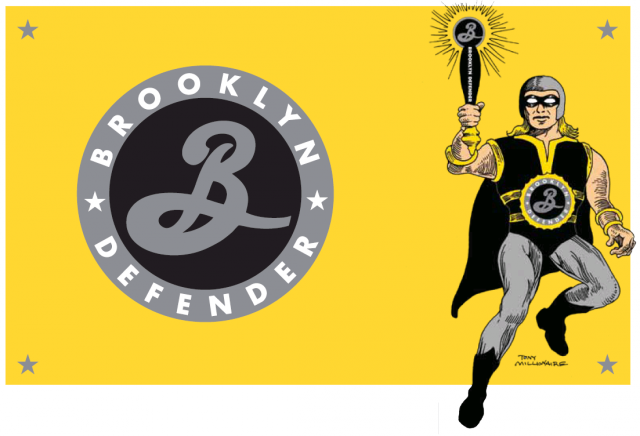 Brooklyn brewmaster Garrett Oliver brewed up The Defender, and the brewery worked with DC Comics designer Milton Glaser, who came up with the beer’s logo, and cartoonist Tony Millionaire, who drew up the superhero you see above. Unfortunately, the brew will only be available in a handful of bars in Brooklyn and Manhattan, but I guess that makes sense; it was brewed specifically for New York Comic Con after all. In general, I’m a fan of superhero-themed brews, though I’m not sure why. I’m not really a comic-book kind of guy. 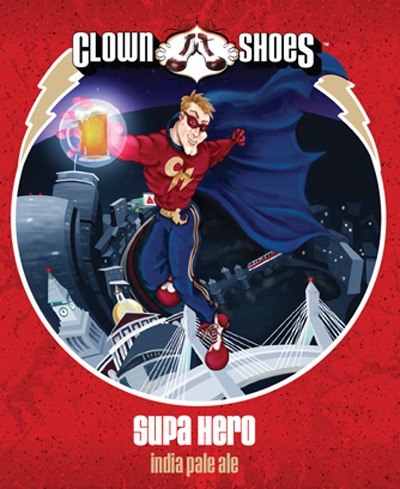 I’m particularly partial to Clown Shoes’ Supa Hero IPA. If you’ll be in Brooklyn next week and want to attend the launch party, you should send an RSVP here. “Once, a long time ago, benevolent Beer Gods bestrode the lands of the world, bringing wonderful beer and great happiness to the People. Collaborating joyously among themselves, the Beer Gods defended the pleasures of the table and promulgated the virtues of Flavor, Variety, Deliciousness, Versatility and Honesty in beer. And the People loved them for it. “But the Beer Gods were far too trusting – in truth, they were not without enemies. Out of the stygian depths of the Earth’s crust rose a cabal of anti-Beer Gods, the Megaliths. Taking the peaceful Beer Gods by surprise, the warlike Megaliths cast a powerful spell that drove the Beer Gods down into the shadows. Flavorful beer vanished from the land, and the People wept. Their victory complete, the Megaliths sent among us the ghostly pale, thin tasteless beers known colloquially as “foam jobs”. Blandness led to mediocrity, mediocrity led to hate, and hate led to suffering. And O, how the People suffered! They forgot the true taste of beer, the soft rustle of barley, the smell of hops.